Or rather, two whole megillahs. These small scrolls represent fine examples of the Book of Esther, commonly known as the Megillah (from the name for a standalone scroll -- and thereby for a long story). 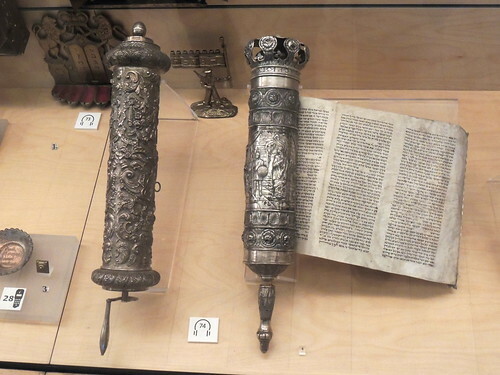 In the Museo Sephardi in El Transito Synagogue, Toledo. The one on the left is 20th century, origin unknown. The one on the right is from 1920, Central Europe (but in the Separdic tradition). The Chanukah menorah behind (bronze, Israel, 20th c.) features a soldier -- looks kinda like a WW I doughboy to me -- holding a rifle in one hand and a banner reading "Chanukah" in the other.